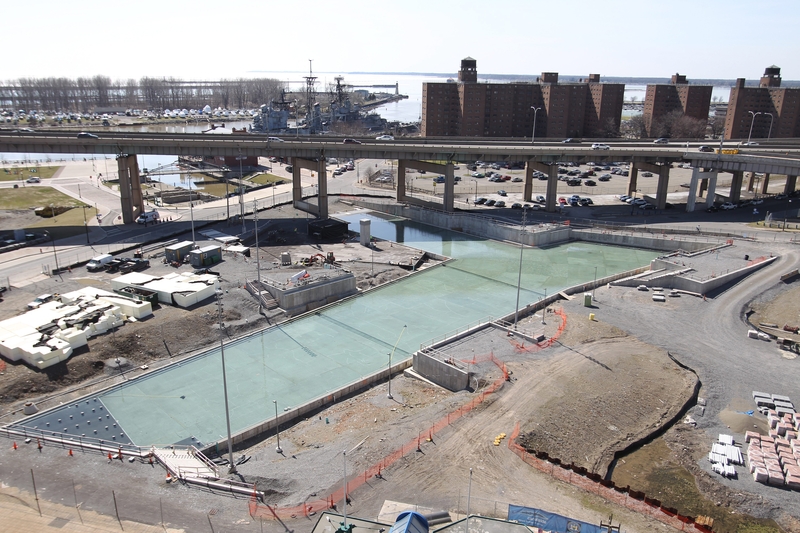 The replica canals on Buffalo’s waterfront were filled with water last week for testing. It may seem as though progress at the city’s Canalside project has been painfully slow and, in traditional terms, it has been. The $20.5 million project to build replica canals at the historic western terminus of the Erie Canal has been bedeviled by construction delays that included a legal dispute involving one of the contractors and Albany’s normal foot-dragging ways in producing promised funding. It was a 10-month project that was supposed to have been completed in November 2012 – 17 months ago. That was changed to June 2013, then November 2013. And it’s still not finished. But traditional terms don’t apply here. In traditional terms, it takes years and years for absolutely nothing to happen in Buffalo. Decades, even. The fact is that, delays notwithstanding, the project is expected to be completed by this fall and that counts as speedy, indeed, when measured by the long-standing currents of Buffalo Standard Time. This project is happening. Only a few days ago, the “canals” were filled with water to test their ability to perform as reflecting pools in the warm weather and skating rinks in the cold. If the structures pass the water tests, they will be drained so a waterproof membrane can be applied, followed by canal stones and, for winter, ice-making materials. And then, where only a few years back Memorial Auditorium stood, abandoned and decaying, will be an attraction that will draw residents and visitors, alike, year round. When it is fully developed, the site will feature the Explore & More Children’s Museum, which is moving from East Aurora, a public market and a full-scale restaurant. A wine garden and food kiosks may also be built. The project is just a piece of a large development that prominently includes the HarborCenter hotel-ice rink complex now arising on the Webster Block and the Courtyard Marriott-law office that has taken the place of the former Donovan State Office Building. And, across the street from the canals, the summer Thursday concert series that used to shake Main Street has taken up successful residence. All of which is to say that the concept of Buffalo Standard Time is dying. The delays that have characterized this snake-bitten project seem no longer to be typical. That’s yet another reason to cheer when the canals are filled for good and the construction crews have finished their work.